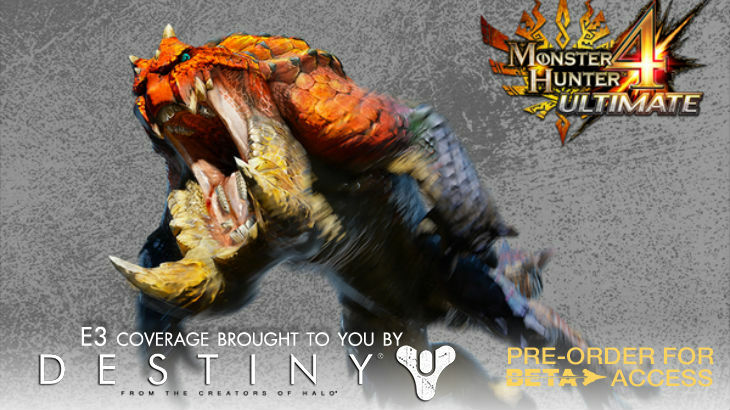 For those of you who are fans of the grind-fest known as Monster Hunter, the new iteration has a bunch more to offer. I got my hands on with the game’s 3DS demo, taking on a new monster. Capcom has shown off a new class of monsters in MH4U – amphibians. The first tier monster is Tetsucabra, a strange tusked frog monster who is ridiculously strong and has some cool moves. I played the 3DS demo which meant that I was teamed up with another guy playing on the 3DS. It’s a good thing, too, because I already got stuck in the starting area. After grabbing some rations and potions from the chest, I was ready to set out. However, the 3DS controls were completely confounding – I couldn’t even figure out how to leave the starting area. After wandering around for a while and (unsuccessfully) trying to jump down to the next area on the map, he eventually helped me with the controls so that we could hunt down our prey together. In general, I still find the controls on the 3DS rather unwieldy – the camera just doesn’t move the way it should and I often would lose site of our monster as a result. This game is definitely built better for the Wii U.
I opted for the heavy hammer, something that ended up being a good choice, I think. Much like previous Monster Hunter games, it’s about finding a balance between unleashing attacks and having enough stamina to dodge when the monster takes a swipe at you. The Tetsucabra is certainly able to deal plenty of damage – his tail can swing at you, he can throw rocks from his mouth, and with those high jumps (as expected with a frog) he can get around quickly and easily. Before you ask, no, we didn’t manage to kill him within the time limit. However, I think that was more because of the issues with leaving the starting area rather than the difficulty of the demo. Within the allocated time, I managed to use my hammer to take out the one tusk on his face, knock him out a couple times and even survive without having to restart at the base camp. During the demo, there weren’t any Felyne to help out. I’m not sure if it was because I was playing coop with the other 3DS player, but I certainly missed my little comrades. One of my favorite parts of the franchise are those little guys – they are helpful in battle and add some frivolity and humor to the ridiculously grind-filled hunting. Of course, the coop was also a lot of fun, and would probably be even more enjoyable if you actually know your hunting partner. Next article Lazygamer.net is looking for an intern. Are you up to the task?